"In the movies when the hero beats up the neighborhood bully everything is supposed to be ok; well not in my hood." Now who said Craig (Ice Cube) couldn't save the day two Fridays in a row? Well with the help of DJ Pooh (producer), Cube produces another laugh-and-a-half. All jokes aside, this movie was not bad at all. I was expecting either another big hit or big miss from Mr. Cube, and what I got was something somewhere in between. Now I would be telling a huge lie if I said that this film didn't miss the talents of Chriss Tucker—but Smokey went to rehab.Despite Tucker's absence, with supporting characters such as Day Day (Mike Epps), the movie holds it's own weight. John Witherspoon also returns as Craig's ghetto father (the dog catcher), and who can forget Tommy Lister as Deebo, the neighborhood bully out for his rematch with Craig. 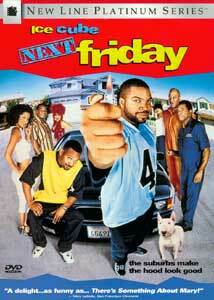 Next Friday picks up where last Friday left off. After Craig knocks Deebo the **** out, Deebo does a few years in prison. Now guess what! Rumor has it that Deebo is breaking out this Friday. When Deebo does just that, Craig is forced to move out to the suburbs to stay with his crazy cousin Day Day and his X-rated uncle Elroy. Craig soon finds out that the suburbs make the hood look real good. It takes Craig a moment to adjust to his extended family, and it's not long before he finds himself in another 'save the day' type situation. After helping his cousin to lose his job and the house, Craig decides that the right thing to do is to rob a few Mexican ex-convicts next door. Way to go Craig! Well before it's all over Deebo catches up to Craig and the real fun begins. The difference between the original and the sequel is that latter simply isn't as dirty as the former. One thing is for sure, that what the film lacks in gritty comedy it makes up for with a good soundtrack. The music wasn't all hip hop which is what I expected from a fellow NWA member. There was hip hop, R&B, Latin music, and plenty of disco. I even heard some David Bowie in the mix. The score for the film was done by Terrence Blanchard who played trumpet for the Branford Marsalis quartet. You may remember his work on Spike Lee's Mo Betta Blues, and Malcolm X. The music tends to push each scene in the proper direction. I found the music to be very uplifting in this film. Image Transfer Review: Once again New Line gives us a top notch transfer, full of bright, well-rendered colors devoid of color bleeding. Fleshtones are normal, blacks true, and shadow delineation excellent. This one will afford you a summer's breeze even in winter. Audio Transfer Review: The audio comes through heavy and hard on this one. I was really surprised at the versatile musical selection chosen for the film. 5.1 Digital Dolby sound, along with the musical selection made this film very enjoyable. The base was clear and heavy. The levels from scene to scene were just right, never too loud or soft. This excellent mix, contains a full surround stage, and exact imaging. Conversations are not overrun by the music, which is heard in its proper place—the background. In a scene where Craig plots on the neighbors from outside their home, the music sounds as if it's coming from inside the house, making me think I was standing on the front lawn. The audio transfer was very clear and concise. Another fantastic new Line transfer! Extras Review: Welcome to the lovely suburb of Rancho Cucamongo! The interactive menu was easy and entertaining as well, allowing you to stroll down the actual streets of this California suburb. You can visit a shopping mall or visit the suburbs high profile neighbors, such as Pinky. You can even go to Pinky's record shop and view music videos for the film by Ice Cube and Little Zane. The DVD also features a blooper real featuring most of the actors in scenes that I found funnier than the movie at times. It really looks like they had a good time filming this comedy. A filmography section for all the actors in the movie is included The alternate ending wasn't too hot, but the Mike Epps audition tape was a lot warmer. It's always fun watching how characters are cast after you've seen the movie. Overall the extras were done quite well. The movie was a cool piece of comedy, even without the hillarious Chris Tucker—although I still prefer the first installment better. More than anything I enjoyed the soundtrack. New Line's Platinum Edition presentation is, as usual, another showcase of "how to make a special edition DVD." I look foward to the the next piece of work from Cube Vision, as well as New Line. Recommended.